← Celebrations tubs in 2009: now with 12.3% less chocolate! Up until Home on the Range in 2004, Disney was releasing a hand-drawn animated feature pretty much every year. The Princess and the Frog marks their return to the form after a gap of five years. I read the story behind this output interruption in a few places, but it became clear that nobody was bringing the data behind it together in a clear way, so that’s what I’ve tried to do here. The turning point is 2004, and the question is this: What will become of animated movies in general, and Disney animation in particular? Before we go any further, we should first consider the difficult subject of what makes a ‘good’ or ‘bad’ film. We might expect ‘the public’ to be more fickle and hold more irrational biases than critics, so if we want to do any kind of analysis on film quality we need to decide which metric to use. (Note that you can click to view the full size version, as with all the graphs on this blog). The relationship between critical and public opinion is not as loose as we might have expected, so either metric can be used. The trends are clear. 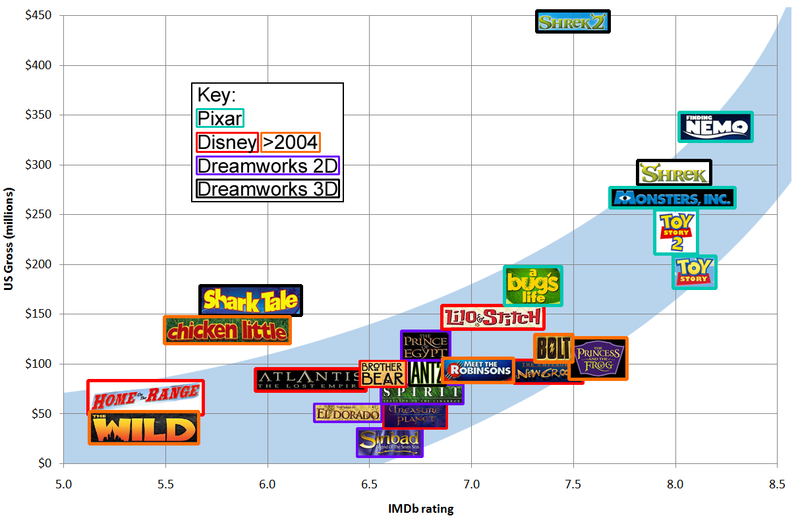 Pixar is riding high, Dreamworks is solidly mediocre in 2D and 3D animation with the notable exception of Shrek (and so, inevitably, Shrek 2), while Disney’s output is inconsistent but mostly below Dreamworks’ 2D output – a pretty poor position considering their heritage. Caveats: US gross is used instead of International gross as that depends on too many other factors to give a clear output. Production budgets are released by the studios but are likely to deviate from the ‘true’ figure depending on their motives. 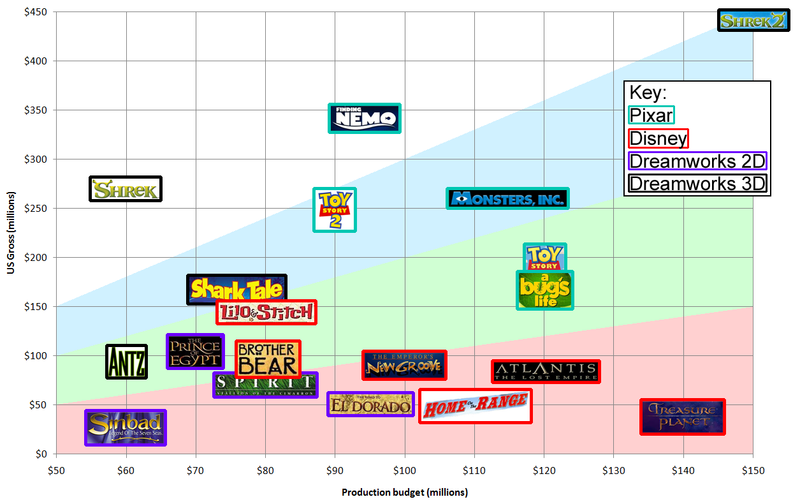 Marketing budgets will also be significant, as will revenues from merchandising and (particularly for animation) DVD sales, so this data alone cannot be used to derive profitability – but it should be a good guide. With the exception of the surprisingly excellent Lilo & Stitch (2002) and Dreamworks’ first foray into 3D, Antz (1998), the profit-making upper field are all 3D, while the loss-making lower portion are all in 2D. Why is this the case? Pixar were desperately trying to prove the potential of the 3D medium, and then maintain that success. A single failure on their part could undo all the years of work it had taken to get to Toy Story. 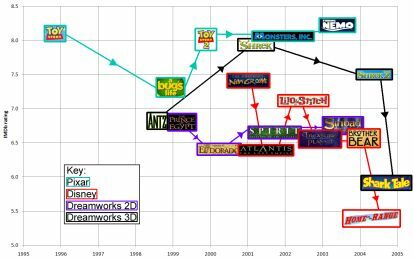 Disney could be described as complacent, apparently expecting the world to enjoy whatever they put out – with the fascinating and ambitious exception of Treasure Planet (2002), in which 2D animation was drawn on top of 3D renderings, with disastrous (financial) results. Dreamworks had Shrek and that was about it – a lucky break, and an outlier compared with their other animation output. Well, in the case of Walt Disney himself, it’s generally agreed that he would have invested in 3D animation long before, as he had pioneered so many major animation advances in his lifetime. For the current Disney studio, it seemed clear that they should at the very least get into 3D animation. This was a fair conclusion. What seemed far less reasonable was the decision (made even before Home on the Range came out) to abandon hand-drawn animation entirely – along with decades of accumulated tacit knowledge and expertise – and to utterly fail to address the far harder creative problem of making Good Films, regardless of the medium used. The result was Chicken Little (5.8 on IMDb, 36% on Rotten Tomatoes) and The Wild (5.4 and 18%), with box office performance and ratings even worse than the abandoned hand-drawn animation features. If you can’t beat them, buy them – so Disney bought Pixar in 2006. Much as I am wary of attributing broad historical change to individuals for the convenience of storytelling, it seems clear that Pixar’s John Lasseter Knew What He Was Doing. He recognised that the true aim should always have been to make Good Films regardless of the medium, that abandoning traditional hand-drawn animation was a terrible and almost irreversible mistake, and with this understanding and his new position as Chief Creative Officer for both Pixar and Walt Disney Animation Studios, he began to turn things around. The 3D got better. Meet the Robinsons came out in 2007 (IMDb 6.9, RT 66%) and was followed in 2008 by Bolt (IMDb 7.4, RT 88%); the recently released Princess and the Frog (IMDb 7.6, RT 85%) represented the triumphant return to the kind of hand-drawn animation that had driven Disney’s reputation for so many decades. This leads us to the final crucial point: to what extent is the quality of a film reflected in its box office returns? The broad sweep is that better films get better results, but it’s clear there is some substantial variation. A key additional factor is reputation (or expectation). Chicken Little performed surprisingly well given it’s rating, as movie-goers were optimistic about Disney’s move into 3D. Similarly, Shark Tale rode high on the success of Shrek. 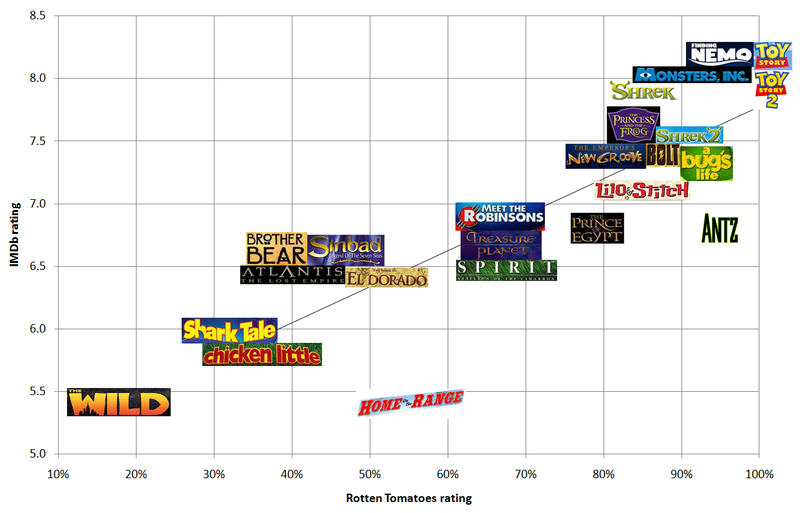 On the other side of the curve, Toy Story was highly rated and very successful, but with no reputation to support it sits at the bottom of the box-office curve. What’s of most interest here is The Princess and The Frog: very well received, but at the bottom of the curve, demonstrating how far Disney’s reputation has fallen. Bolt demonstrates the same problem. Disney themselves must now maintain the strong output, as a single flop could undo the years of work it has taken to rebuild to this point. The more general lessons to take away are first, beware of confirmation bias and correlation / causation errors; and second, in creative endeavours, the ends justfiy the means. Or to put it another way, the picture is more important than the camera. P.S. If you want to analyse the data yourself, I’ve put what I gathered (including worldwide gross figures) in this Google Docs spreadsheet. This entry was posted in analysis and tagged analysis, animation, movies. Bookmark the permalink.